President of the Massachusetts State College (now UMass Amherst) from 1933-1947. 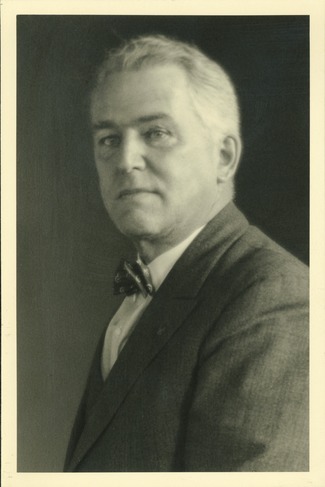 Includes correspondence with college, state, and federal officials, college suppliers, and alumni; speeches and articles; reports and other papers on topics at issue during Baker's college presidency, 1933-1947, particularly the building program; biographical sketches and memorial tributes; clippings and other papers, relating to Baker's career as professor of forestry at several colleges, trade association executive, and college president. Born January 20 at St. Croix Falls, Wisconsin, the fifth of six sons of Joseph S. and Alice (Potter) Baker. B.S., Michigan Agricultural College; worked briefly with K.L. Butterfield. Assistant and Associate Professor of Forestry, Iowa State College. Master of Forestry, Yale University; married Fleta Paddock of Three Oaks, Michigan, December 27. Professor of Forestry, Pennsylvania State College. Doctor of Economics, University of Munich. Dean, New York State College of Forestry, Syracuse University. Executive Secretary, American Paper and Pulp Association. Manager, Trade Association Dept., U.S. Chamber of Commerce. Member, advisory committee, Timber Conservation Board. LL.D., Rhode Island State College. President, New England Forestry Foundation. University of Massachusetts; Resigned presidency of University of Massachusetts, effective in Sept.
Died May 24 at Orlando, Florida. The Hugh P. Baker Papers, 1919-1951, are made up of biographical materials, copies of some of Baker's writings, and administrative and official papers from his presidency at the Massachusetts State College, which began in 1933, soon after the institution had been renamed Massachusetts State College in 1931, and ended a few months after the institution became the University of Massachusetts, in 1947. The papers consist of correspondence and memoranda exchanged with members of the faculty and staff and with state and federal officials, as well as reports on problems connected with the fiscal drought of the Great Depression of the 1930s and the labor-short and student-short period of World War II. The bulk of the administrative papers document the College building program in which Baker's administration brought several new buildings to the campus and launched the planning of a number of others. Some construction was funded from federal sources, while other building was financed by the Massachusetts State College Building Association, which the General Court chartered in 1939. The activities of the Building Association in particular alleviated the shortage of student housing on campus, which had long been the major barrier to the expansion of the College's educational program. The building program not only accommodated the moderate growth of the College's enrollment during the 1930s, but laid the foundation for the rapid expansion of the institution which began with the end of World War II and continued into the 1970s. The papers also include correspondence and other materials related to the donation and manufacture of the Old Chapel Chimes, installed in 1937; the celebration in 1938 of the 75th anniversary of the founding of the College; the dispute between the State Commission on Administration and Finance, and College and federal authorities over the use of Federal Land Grant Funds; and the development of the School of Home Economics. Further information on the course of affairs at the institution during Baker's tenure may be found in the published Annual Reports of the institution in RG 1/00/2, and in the papers of other college officials of his day, such as those of Dean William L. Machmer, in RG 6/1. Some Baker correspondence, probably related to his roles at the Syracuse University School of Forestry and the American Paper and Pulp Association, are in the Ralph S. Hosmer and the National Forestry Program Committee papers in the archives and manuscripts collections of the Cornell University Library. The subject files of the Baker papers include general biographical materials and a variety of addresses and short articles he wrote between 1930 and 1947. The biographical materials extend from 1930 to 1951, and include biographical sketches and memorial tributes, materials related to degrees both earned and honorary, memorabilia, and several folders of newspaper and magazine clippings on his activities from 1930 to 1947. For photographs of Baker see RG 110/1. The administrative papers of the President's Office generated while Hugh P. Baker held the office from 1933 to 1947 make up this series. They includes memoranda and correspondence with college, state and federal officials, with the College's suppliers and alumni, and reports and papers generated by College administrators and faculty, all on a variety of topics at issue during Baker's presidency. The papers came primarily from the Secretary's papers. These files had been managed by Secretary Robert D. Hawley until he became the College's Treasurer in 1939, then by James W. Burke, who succeeded as Secretary in 1939 and held the post until his retirement in 1958, and then by Secretary and Liaison Officer Robert McCartney, who died in 1975. As received, the papers were filed largely by subject, and the arrangement used here is representative of that found in the original files. Although materials on many specific projects and problems Baker dealt with are found here, his papers do not seem to be as broadly representative of the issues he dealt with as the corresponding papers of earlier presidents. The bulk of the administrative papers deals directly or indirectly with the College's building program, the pace of which picked up under Baker in spite of the Great Depression of the 1930s and World War II. Federal money for buildings was channeled through the Massachusetts (State) Emergency Public Works Commission (folders 54-56), and money for other improvements in the physical plant became available through the U.S. Works Projects Administration (folders 111-119). Even U.S. Emergency Relief Administration funds, generally used to enhance payrolls and student aid funding, were occasionally mobilized for grounds projects (folders 103-104). Further, after two campaigns, [see Mass. (State) Legislation (folders 57-63)], the M.S.C Building Association (folders 45-46) was chartered to fund the construction of dormitories and other income generating buildings. Further information on the building program under Baker is found under the headings Buildings (folders 11-19), and Women's Program (folders 120-128). The following items from this subseries are located in map case 2, drawer 3: a 1933 organization chart in blue print of the College; plans for buildings 25, 33 and 35; diagrams of two projects at the Experiment Station at Waltham; and plans for a proposed armory and for road construction connected with project ST 5, both of which were proposed to the U.S.W.P.A., but only the latter was funded. Other highlights of this series include correspondence and/or papers connected with the donation and manufacture of the Old Chapel Chimes, installed in 1937 (Chimes--Old Chapel, folders 20-21); the celebration in 1938 of the 75th anniversary of the founding of the College (Diamond Jubilee, folders 28-29); the lengthy dispute between the State Commission on Administration and Finance on one hand, and College and federal authorities on the other, over the use of Federal Land Grant Funds, folders 41-44; the dispute between State authorities and the College over its management of revolving funds and endowments (Mass. (State) Auditor, folder 48; Mass (State) Legislation, folders 57-63; and Trust Funds and Scholarships, folders 88-100); the hearings in 1938 following the firing of chief engineer Howard Bidwell (Personnel, folders 65-7-1); the Lotta Crabtree Agricultural Fund and the Hood Foundation scholarships (Trust Funds and Scholarships. folders 88-100), and the development of the School of Home Economics (Women's, Program, folders 120-128). Other headings include Administrative Planning; Alumni; Appointments; Associations; Chapel; Conferences and Summer Schools; Course of Study; Departments; Extension Service; Gifts, Solicitations, etc. ; Graduate School; Grounds; Inauguration; Mass. (State) Attorney General; Public Relations; Report to Board of Trustees; Resignation; Sigma Xi; Student Matters; Tuition and Fees; U.S. Bureau of Education; and U.S. Funds. Course of Study: B.A. Degree Comm. Grounds: Blundell Report "Campus Planting-Arboretum"
Mass. (State) Emergency Public Works Comm. Mass. (State) Legislation:- "Dormitory Bill" Corr. Mass. (State) Legislation - "Dormitory Bill" Corr. Sigma Xi: Faculty Honorary Society- Pet. Trust Funds and Scholarships:- Plumb Fell. U.S. Funds: Bankhead-Jones Papers and Mem. U.S. Funds: Jones Papers and Mem. Selected materials in this collection have been digitized are available for viewing online through SCUA's digital repository, Credo. Processed by W. B. Cook, Jr., 1982. Encoding funded by the Andrew W. Mellon Foundation. Digitization of selected materials was made possible by a grant from the Massachusetts State Historical Records Advisory Board and the Commonwealth of Massachusetts. Cite as: Hugh P. Baker Papers (RG 003/1/1933). Special Collections and University Archives, W.E.B. Du Bois Library, University of Massachusetts Amherst. Massachusetts State College. School of Home Economics --History--Sources. University of Massachusetts (Amherst campus)--History--Sources.